The Food and Agriculture Organization of the United Nations has relisted North Korea as one of the 37 nations suffering from food shortages, a US broadcaster said on Friday. In its fourth-quarter report on Crop Prospects and Food Situation, the FAO has included North Korea in the list of countries that need external assistance for food, according to Radio Free Asia. The FAO said North Korea saw a reduced agricultural output due to a drought, and international sanctions have led to an economic downturn, resulting in declining food imports and international assistance. “Most North Korean households are anticipated to continue to experience borderline or poor food consumption rates,” the FAO said in the quarterly report. According to the FAO report, North Korea secured 685,000 metric tons of cereal imports between November last year and end of October this year, which consisted of 572,900 tons in commercial purchases and 112,100 tons in food aid. The country’s food shortage amounted to 459,000 tons. The FAO attributed the North’s chronic shortage of food to its vulnerability to natural disasters such as flood and drought, as well as a lack of farming machines and fertilizers. 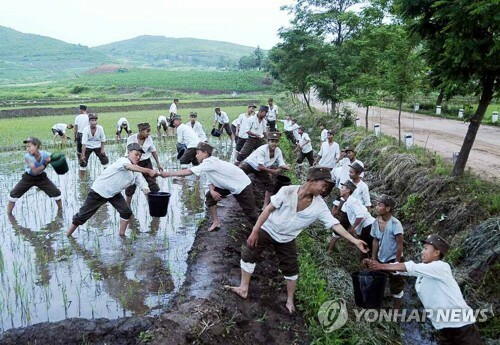 The FAO noted that because of the severe drought, North Korea was in need of immediate supply of irrigation equipment such as pumps and sprinklers.